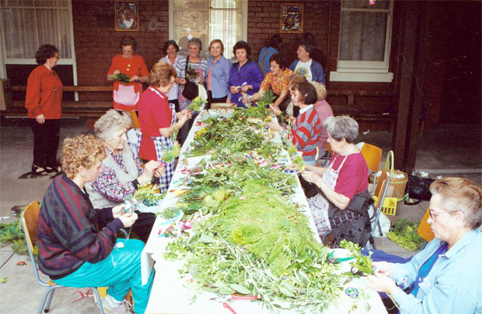 Slovenian traditions and customs travelled to Australia in the hearts and memories of Slovenian immigrants. During the era of the post World War II communist regime, some customs, particularly religious ones, were prohibited from being practised publicly in Slovenia. Some religious customs were kept alive mostly by villagers and city people of strong faith. School children who attended religious instruction at church were ridiculed by school teachers. This resulted in Slovenians and theiran descents preserving customs and culture with pride. Slovenians all over the world celebrate the Christian holiday of Easter with their own unique traditions and customs. The beginning of the Holy Week, Palm Sunday, remembers Jesus’ entering Jerusalem on a donkey, and the people laying robes and palm branches on the ground before Him. In a very symbolic act, Slovenians mark the start of Easter by taking olive branches and bunches of richly decorated greenery to Church for special blessings. 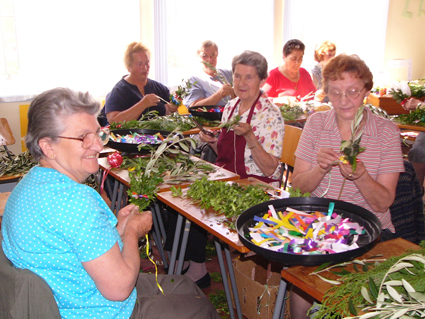 Cvetna nedelja – Palm Sunday with the traditional butarice at the Slovenian churches in Australia. Australian churches offer an Ecumenical service on Good Friday when people of Catholic, Church of England and Methodists dominatiions join in procession Stations of the Cross, rotating the venue every year. After the prayes, Hot Croos buns and cup of tea is offered to everyone. A move that promoted unity , inclusiion and exceptance of each other at that Holy time. In Slovenia, the church bells are fixed and aren’t rung. During this time the raglja (a special rattle) is used in place of the bells in Churches over the Easter celebrations. In Slovenia no bells ring from the churches from Good Friday until Easter Sunday morning. Families get ready a selection of traditional Easter foods in a jerbas (wicker basket) and take it to church for blessing (in Australia at the Easter Sunday Mass as well). The blessed food from the jerbas is set out on the table to be enjoyed as the first meal on Easter Morning after early Mass and the Easter procession. Velikonočna nedelja – Easter Sunday – blessing of the traditional Easter foods: potica – walnut roll cake, symbolising Christ’s crown of thorns; ham – symbolising Christ’s body; fresh horseradish root – symbolising nails, nailing Christ to the cross; pirhi – real Easter eggs, painted eggs – symbolising new life, or drops of Christ’s blood, all placed in košarice – baskets, covered and lined with white cloth, decorated with red carnation and rosemary. For all the Slovenian churches in Australia Easter is a very special time with many Slovenians and friends attending the services. Games involving Easter eggs continue to be enjoyed by new generations of Slovenian Australians. 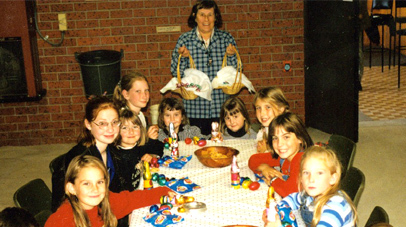 A strong tradition in the Slovenian community continues to be the Easter Monday Picnic, with games for both children and adults. The most well known game, pirhe sekat, involves throwing a coin at an Easter egg and a successful player is the one whose has the coin nicely embedded in the egg! Another old game is trčanje, where contestants use their Easter eggs in a form of lawn bowls. The winner’s egg stays unbroken. The Slovenian Easter calendar concludes with the fun and lively celebrations of the Easter Monday Picnic where music, dance and games are enjoyed after the more subdued days of Lent. The Easter Bunny also visits the children. 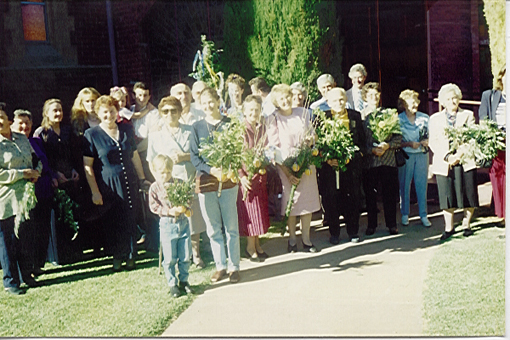 “We remember, when we were small, taking the ‘butarice’ to Slovenian church for blessing on Palm Sunday – of course in our best dress and pants. 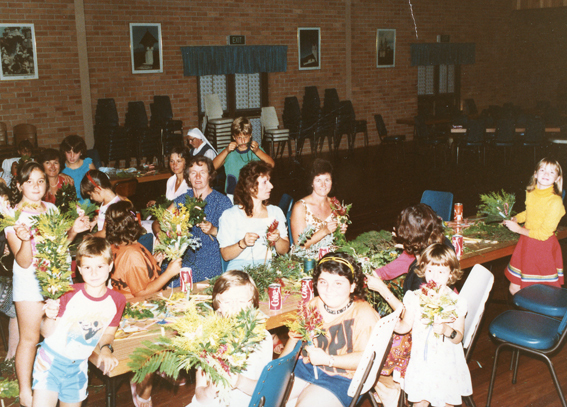 Our Mum made the ‘butarice’ every year. We remember as well, the Mass being very long. For Easter Sunday we remember, we were very hungry in the morning. See, Mum and Dad would not allow us to eat anything before we had the traditional blessed Slovenian Easter breakfast. After Mass, of course. We took the Easter basket of food for blessing (a nice basket, lined and covered with a white embroidered cloth). The basket was filled with ‘potica’ and bread, ham, horse radish root, real Easter eggs (coloured boiled eggs) and sometimes some bread as well. The basket was taken close to the altar so the blessed water drops would reach it. We could hardly wait to get home. Mum took all the food from the basket and put it on the while cloth from the basket. All the food had to be on the white cloth. Ham, Easter eggs, potica and bread – everything nicely on the cloth. Our Dad sliced the ham and grated the horse radish root – it really hurt the eyes if we were too close. Then we sat down at the table and we ate the blessed Easter foods. 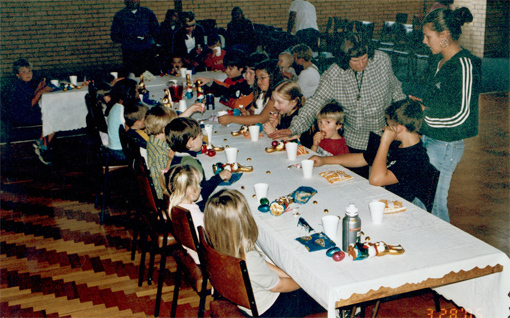 There were no plates or cutlery on the table – everything was eaten with fingers – licking our fingers, of course. How strong was the horse radish!! But we learned to love it! and still do. 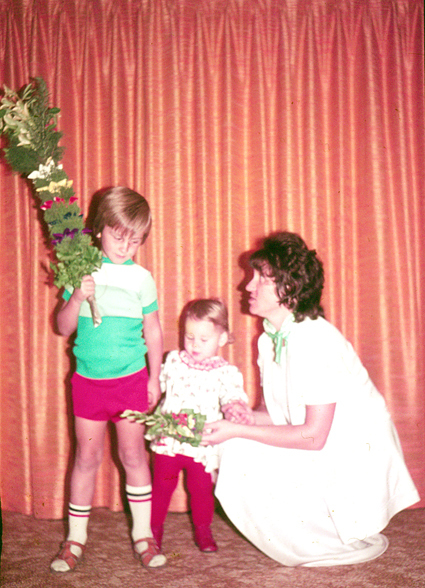 Those were the most beautiful times of our growing up – Easter Sunday and the Slovenian traditions.